ATLANTIC CITY — The 300 block of North South Carolina Avenue, a straight shot uptown from Resorts, comes as a bit of a shock to the two organizers, one from Philly and the other up from Washington, as they turn the corner, clipboards in hand. Two of the houses where registered voters are supposed to live are vacant, and men and women spill out onto porches and steps along the block with varying interest in whatever it is they imagine the canvassers want, along with various warnings not to photograph and to keep moving. What these canvassers want, signature by signature, is not a completed absentee ballot for the heated mayoral primary, another topic of frantic canvassing in A.C. these days, but a way to keep the State of New Jersey from selling the municipal water authority, currently worth more than the recent sale prices of the shuttered Revel and Showboat casino hotels combined. A one-year moratorium preventing the state from taking any action to monetize the water works expires this month, and advocates and residents are girding for battle. Their rallying cry: "We're trying to stop Gov. Christie from selling the water to a private company." Stoop by stoop, porch by porch, nearly faucet by faucet, it's the most effective pitch. This, after all, is a city where the combative governor has long battled local politicians, and in November got his way with a takeover that effectively outsourced the city government to a favored law firm in West Orange, which so far has billed more than $1.1 million. "They sold the city," said Deana Smiley, 48, a dealer at the Golden Nugget, leaning out over her porch. "The state took over the city, and once they did, it's a wrap. Meaning we're done." Not so fast, say civil liberties and water watchers. Working out of a donated Arctic Avenue former pizzeria being turned into a bakery, Lena Smith of Food and Water Watch is overseeing the 48-block petition drive. She hopes it will stave off any attempt to sell or lease the Municipal Utility Authority to one of several politically powerful water companies, including New Jersey American Water, whose lobbyist is Philip Norcross. He is the brother of South Jersey Democratic power broker George E. Norcross III. Parent company American Water just broke ground in Camden on the strength of $164 million in tax subsidies. Two petitions are being circulated door to door and left on the counter of the MUA itself as residents come by to pay their bills. There are community leaders like Libby Wills organizing in her First Ward, Carol Ruffu in Chelsea, August Garrett in Venice Park. ACLU lawyers say they need 15 percent, or 814 signatures, of the number of Atlantic City residents who voted in the 2015 Assembly race to force a referendum on selling the utility in a special election, and 10 percent (514 signatures) to put the measure on the general election ballot. Their goal is to collect 1,500 signatures, said N.J. ACLU spokeswoman Allison Pelzman, because "we know the residents of Atlantic City do not want their public resources sold without their participation, and we want the numbers to reflect that public sentiment." They are working on two tracks: One targets action by the state under the takeover law, seeking "the same statutory rights" as any other municipality by way of referendum; the other seeks similar referendum power, but under the 2015 Water Infrastructure Protection Act, which gives citizens 45 days to file petitions seeking a referendum on any sale or lease of the public water system. 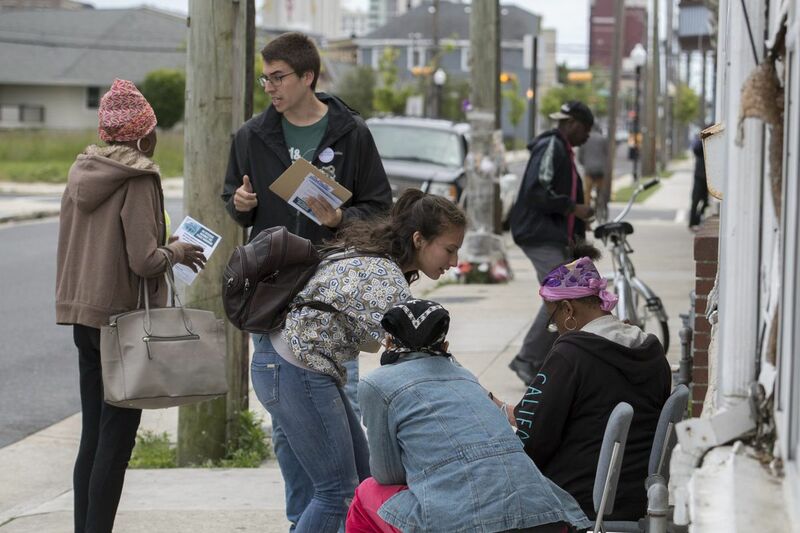 In both plans, the activists, who have funded a full-time organizer in Atlantic City for the better part of a year, are working to get citizens the right of approval before the state can take action. The Municipal Stabilization and Recovery Act, however, gives the state vast authority to sell assets and dissolve authorities, including the MUA, worth in excess of $100 million. Christie recently said, somewhat ambiguously, that he would be "protective" of the MUA. Prior state monitors tasked with Atlantic City's recovery have recommended not selling the authority, which controls valuable water reserves in Pleasantville. Brenda Smith, a school crossing guard, wandered into the storefront to help, and said she was concerned water privatization would lead to rate hikes and put the quality of the water — credited for the city's excellent bread — at risk. Others worry about a scenario like that in Flint, Mich., which was under a similar state takeover when calamitous decisions were made about that city's water treatment. "We want to do what's necessary to make sure it doesn't get privatized," she said. "We have great water here. We feel like it's part of us, it's like a livelihood. We have to keep it ours." Meanwhile, out on the streets, four workers from the Washington office of Food and Water Watch joined with two interns from Drexel University, Valentina Amaya and Robert Rowl, both 20, to go door to door with voter registration lists and petitions. Jorge Aguilar spoke Spanish to some residents on Arizona Avenue, a street notorious for flooding, a water issue of a different kind. Opposing Christie was a relatively easy sell. After about four hours Wednesday, the canvassers estimated that they had collected about 100 signatures to go with pages of petitions being verified at headquarters, where Linda Steele, a retired Atlantic City tax collector, worked to organize folders of block lists. The door-to-door work revealed that the heavily publicized state takeover, the endless discussions in City Council and in televised news conferences about the water department, speeches about civil rights, and comparisons to Flint, even a visit to town by the national head of the NAACP, did not necessarily result in residents having heard a lot about the issue. Many said they'd heard Christie wanted to take over Atlantic City, but were unaware that he had done so. There was much explaining to be done. "So much stuff is going on," said Wilhelmina Dorsey, a retired housekeeper. "I don't think he should be doing it."